GP&H has embraced the concept of designbuild as an effective delivery system for building owners. We have the capability of providing turnkey engineering along with quality plumbing installation for owners who wish to use this method of construction. We have developed guidelines for meeting with owners to determine exactly what they would like to have included and expect from their facilities. We have design build experience on manufacturing facilities, doctor’s offices, churches and as recently allowed by law, Public Schools in Mecklenburg County. In addition to conventional plumbing, GP&H also offers piping services. We have the experience to install a vast array of fluid or gas delivery systems as well as specialty drain systems to all types of equipment. We provide piping services for medical gasses and vacuum, natural gas, air, potable and non-potable water, acid waste, acid delivery systems, grease and oil lines. At GP&H, plumbing renovation work is a large percentage of the work that we do. We enjoy the challenge of helping to change underutilized areas into efficient usable space. Through the years we have removed countless yards of concrete, drilled thousands of holes in existing structures and replaced or removed hundreds of piping systems all in an effort to help our customers better use their existing spaces. Projects worth noting include Windsor Park Elementary and Amay James Middle School in Charlotte, and the complete replacement of all water piping in the Independence Arena. local School Boards, GP&H has gained the experience to understand and deliver the needs of the public owner. 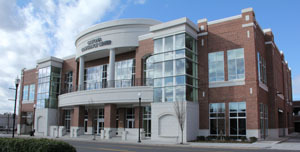 In fifty-five years as both a prime and sub-contractor, we have completed courthouses, law enforcement centers, university and community college buildings, museums, libraries, hospitals, and over 200 public school facilities. eliver to the owner the project they desire. Offering solutions before they become problems, and keeping a close eye on cost and quality is the way we work. In fifty-five years of private construction we have completed office buildings, textile plant facilities, truck manufacturing plants, medical offices, veterinary clinics, funeral homes, and over 100 church facilities. Since 1947 Gastonia Plumbing & Heating Company has been owned and operated by the Styers family. Founded in 1947 by J. B. Styers and his wife Iva, GP& H specialized in utility work and municipal, institutional and commercial plumbing and heating contracting. The post World War II era in which the company was formed held many opportunities for a small family business. The Styers’ took advantage of those opportunities performing utility and plumbing work across much of the western part of North and South Carolina. In the mid 1950’s another member of the Styers family joined GP& H. After graduating from N. C. State, W. Wesley Styers returned home to become an important part of the family business. Under his leadership GP& H phased out it’s utility division and began to concentrate more on plumbing and heating contracting. In the mid 1960’s, shortly after the retirement of J. B. Styers, a second son became a part of GP&H. C. Neil Styers after earning a B. S. in Mechanical Engineering at N. C. State joined his brother in the family business. At this time GP& H began to concentrate solely on commercial and institutional plumbing work in and around the Charlotte area. Continuing to build a strong business through hard work and deliberate planning, the Styers brothers continued to add family members to the staff at GP&H. Now a third generation of family is busy at Gastonia Plumbing & Heating. After college,Wes Styers joined the firm in 1990.Today GP&H continues to experience unprecedented success in the plumbing industry. Hard work, deliberate planning, and three generations of experience mean doing the job right the first time.